Written out with felt-tip marker, with images scanned, reduced, printed, and photocopied on Gold Fiber Confetti Paper. Alphabet adapted from the Enviro Typeface. 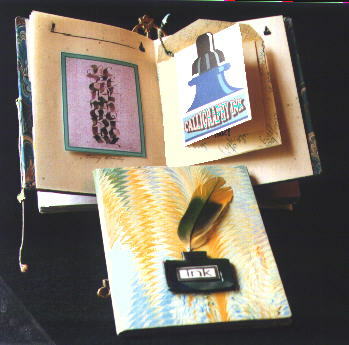 The quill and inkwell on page 4 and tiny book cover inside printed out from Printmaster Platinum. Turkish Marbled paper cover over matboard. Cover inkwell from Sculpy polymer clay. Feathers found at a curiosity shop. Single signature book with sewn-in envelope and secret pockets. Button closure on back secured with Barge cement and cord attached at inside front foredge to wrap around button on back.